Shalcer focuses all his attention on the lands closest to Maradaine, and as a result Southern Druthal gets ignored in all respects. Many lords realize that Druthal is no more and see opportunity they make a grab for power and land. In 700, many of the counties secede and form new nations, grasping on to old cultural identities: Shielik, Nalat, Limarra, Oscina, Tivark and southern Ciolsan become Scaloi; Siltana, Briyon, Jierre and Henitan become Monim; Cijana, Amalade and northern Ciolsan become Linjar; Nirado, Stalakae and Resechet become Yinara. Kesta, like Brellin, becomes its own state. In 704 the Kierans call a meeting of Trade, realizing that most of their treaty and trade agreements are signed with Druthal, and are therefore void for all intents and purposes. As a Trade Convention, it is a dismal failure, being nine new nations represented and quite a lot of bad blood between them all. Kieran politicians use this to their best advantage, pitting the various new leaders against each other, who have no idea that they are being used, but rather think that their new Kieran “friends” are helping them. Warlord Preceptor Korit Hiekar discommendates Terkin from the Order, which results in Terkin declaring war on Monim (as Hiekar was from Vargox). Acoria declares war upon Patyma; Scaloi upon Linjar. Shalcer declares war on all the new nations, saying he will reclaim Druthal, and pledges that the Orders will help him. The Preceptors are wary on committing themselves to Shalcer, as they know that their members owe allegiance to various different kingdoms and lords. When the Preceptors and Grandmasters meet in private, it is decided to not involve the Orders in these internal wars. Vanguard Preceptor Alamarkin states, "In these dark years ahead, We shall be the ties that bind the Trade Nations together. The Orders must place themselves in light of the greater good, and we must place ourselves above any nation, any king, any emperor and even any God who strives against the light. Each man of the orders shall decide for himself which fights he lends his arm to, as his honor decrees, but our pledge is to the Order first." Thus in 705 the Wars of Possession, possibly the bloodiest period in Druthalian history, begin. The first stage of this is The River Wars. The rivers, specifically the Maradaine and its source rivers (The Waish and the Oblune) controlled the land, Shalcer and others reasoned. The mouth of the Maradaine was controlled by Druthal (or Druthalia Proper, as Shalcer had dubbed it), and Shalcer imposed an embargo on all ships trying to go further inland, seizing their contents, as well as ransacking any ship, armed or not, that came from inland. Also, the rivers formed most of the new borders, and as many of these new kings and lords were feeling expansionist, to push ones border one must have control of the river. Therefore, many battles were fought on the water, which required boats and ships. For both Oblune and Monim, this was a considerable problem, as neither nation had an appreciable shipyard. Their boats were rather poor, and their tactics were limited to ramming the enemy, which usually resulted in both boats involved sinking. In 706 an army from Waisholm landed on the north shores of Patyma, and made a march directly for Maradaine. However, the Patymic army tore apart this invading force, whose single-minded march made them extremely vulnerable. The army wore no colors of clan and the Waish king and Clan Lords denied all knowledge of it. In 712 Ian Acorin dies, and the Republic elects Mikael Canar to the seat of Republic President. Canar is an effective administrator, who craves peace above all else. He sends emissaries to Patyma to end their war. At this point, the body count of the River Wars is enormous. However, no one nation is in any better of a position than when they started. Shalcer dies in 719, heralded as "Shalcer, Idiot King of Druthalia Proper". His only son, Malceen, is complete moron, barely possessing the ability to speak in complete sentences, let alone to rule. What remains of the royal court sequesters Malceen away and places his second cousin Cedidore on the throne. King Cedidore (719-754) was brilliant and efficient as a ruler, but was regrettably quite insane. He has no interest in reclaiming Druthal or making war with the new nations. He did, however, begin a massive campaign of conscription and mobilization, to the end of completely sealing the borders of Druthalia proper. King Alasar of Kesta declares neutrality in the Possession wars when it becomes clear that Oblune, Monim and Yinara had been eyeing Kesta as a means against each other. King Terkin II of Oblune heads a massive assault on Vargox, which is almost completely burned to the ground. In Druthalia 722, Cedidore begins "cleansing" his nation by executing any non-Druthalians found. This is also the year of "The Salt War". Convinced that Kestan neutrality is a lie, and that Kesta is truly allied with Oblune, Monic forces march through the salt flats into Kesta. The Monics have superior numbers in the fights, but when they meet the Kestans they are weakened by their march through the hostile climate. There are five battles total, during which both sides almost completely destroy each other. By 723 Cedidore decides that Corvia is not worth protecting or having, as it has little of value and is too separated from the rest of Druthalia. Four ships leave Kyst for Corvia, filled with refugees. Once they are gone, Cedidore declares that no more ships will leave Druthal ever, nor will any dock again. He seals the border-- no trade, no entry or exit for any reason. Thus begins The Quarantine. The true degree of Cedidore's insanity is clear, but to the dismay of potential usurpers, he is too prepared for anyone to be able to remove him from the throne. He is oddly charismatic, and he has manipulated the army so members of it are fanatically loyal to him. Druthalia Proper is now a militant state. In 728 the Pathfinder and Underbrush clans both start a war with Acoria. Acorish President Canar tries to send emissaries to the clans rather than fight. This proves ineffective. Canar tries to give lands to the Waish to appease them. The Waish take the lands, and start to fill them up with soldiers, primed to move forth. The next year King Yar of Brellin notes the ease in which the Waish took the Acorin land. He takes his forces into Acoria up to the Waish River, slaughtering thousands of Acorins. Canar tries offering money to Yar, which he takes, but the Brellic forces do not leave. Canar sends word to any allies Acoria may have to help him. The Kierans send relief troops to Acoria to help remove the Brellic forces from Acoria. The Kierans will not help remove the Waish troops, since Acoria ceded that land to the Waish. In 732 Canar dies in his sleep. Some Acorin officials suspect foul play, but it is never followed up on. Rafael Parrin becomes President. Parrin is not the peacemaker the Canar was, and he pushes retaking the territory lost to the Brellics. Acoric and Kieran troops march against the Brellic troops. The Brellin Army is joined with forces from Jastam. The Waish clans move in as well. The assaults are brutal, and in the end, the city of Talite is burned to the ground. The Kierans follow strict adherence to the Trade Nations Treaties, and refuse to send any troops into Brellin. As the Acorin troops march into Brellin, the Kierans enter Jastam, since their violations give the Kierans right to enter their territory. Meanwhile, a refugee from the Opiskan territory in Druthalia Proper has reached Yin Mara, having escaped the Quarantine. He reports that food supplies are all rounded up and brought to the major cities, while thousands starve in the countryside. He begs for help for Opiska to be free from Cedidore’s tyranny. These pleas were mostly ignored except by a Vanguard named Lotain. Lotain convinced the Yinaran King that he would sneak into Opiska, observe the conditions, and give an objective report for the King to base any decision on. At this point, The wars between Linjar and Scaloi continued unabated. The Acorins lay siege on Gorivow in 737. The city holds for a short while, but soon the defenses fail. However, before the Acorins can enter the city, a diplomatic contingent of Kierans arrive asking that they not further assault the city. Rather, they will arrest and try King Yar for War Crimes. The Acorins balk at first, but the Kierans remind them that they enjoy good relations with the Kieran Empire due to their abiding by the tenets of the Trade Nations Treaties and the Rules of War. The Acorins relent, and King Yar is tried and found guilty. Brellin is forced to pay reparations, and Brellin and Jastam are considered “Dominions of the Empire”, as terms of the trial. Kierans leave an “Administrative Force” behind to govern the regions. In 740 Lotain returns to Yinara from Druthalia, have barely escaped. His report of the horrors under Cedidore’s rule (which is graphic and thorough) shocks, astounds and horrifies the Yinaran court. People are starving, arrested on a whim, tortured and executed for little cause. The king of Yinara, Essa, decides to try and free the Opiskan territory from Cedidore. The Yinaran forces mobilize. For ten years, the Druthalian/Yinaran War progressed no further. The Yinarans attempts to occupy any part of Opiska last for only a few days before they get pushed back again. The northeast settles down, with a Kieran “peacekeeping force” (which very carefully never violates a single treaty) keeping the Waish in line. During this time, Acoria flourishes. The Scallic/Linjari War rages on, with no sign on the horizon for settlement or victory. Kestans break their neutrality and join the Yinarans in freeing Opiska in 754. Cedidore himself, while being almost 70 years old, rides to Opiska to “Show the fools how to fight!” It’s clear that he is quite insane, but he is a capable warrior. He leads the charge against the combined Kestan and Yinaran force. The Druths are beaten, and Cedidore is killed. His eldest son takes the throne, and the title Cedidore II (754-787), claiming that the Cedidores are the “New Maradaines of a New Druthal”. He is just as charismatic and fanatical as his father, but he sees a hopeless cause for what it is. Cedidore II also has five brothers, whom he gives key positions and titles to, helping to secure his place in the government. He withdraws from Opiska, and begins building the “Druthal Wall”, a forty-foot high wall that surrounds the entirety of the nation (even though most of its borders were marked with great rivers—Cedidore II also has the bridges destroyed). This project is finished shortly before the end of his reign. The nation of Free Opiska is formed, with the aid of Kesta and Yinara. The three nations sign a mutual alliance pact. The Kierans also send aid. The Druthal Wall being well underway, the other nations see fit to leave Druthal well enough alone. By 765, the western part of what once was Druthal settles down into a relatively calm area. The Kierans sense an opportunity, and send out emissaries to the various new nations, offering to make trading agreements, build and repair roads, and send in “Peace Patrols” to protect the roads and trade caravans. Kesta, Yinara and Free Opiska accept these offers. The east begins to settle as well, as the war between Monim and Oblune cools, but does not end. Both sides line the Oblune River with soldiers and siege engines (which the Kierans sold to both sides), so that any attempt to cross the river is fatal. This effectively ends active hostilities. The city of Monitel, high in the Briyonic Mountains, is isolated by these actions, having relied on the river to ferry its mined goods to Vargox and Marikar. Although Monitel was technically part of Monim, when goods stop coming from there, it is virtually forgotten. When Cedidore II dies in 787, his son takes the throne as Cedidore III (787-792). Cedidore III is a raving lunatic of a tyrant, however he is completely lacking in charisma and therefore destroys the loyalty from the military that his father and grandfather built up. Without this protection, the other Druthalian lords remove him from the throne in short order and execute him. In an effort to retain some royal continuity, they give the crown to Lord Mishral, grandson of Cedidore by his third son. King Mishral (792-799) seems to lack the madness that ran in his cousin’s line. His short reign concentrated on rebuilding the damage done by the Cedidores, improving the condition of the common man. Unfortunately, while personally visiting a particularly devastated farming village, and mob of angry peasants, blaming him for their situation (for they only knew that the King had done this to them, and he was the King), attacked the King’s train and stoned Mishral to death. His son, Mishral II (799-808) continued to work for his father’s goals. By the end of the eighth century, the Scallics and the Linjari were still fighting their war. The war had gone on for five generations, and the original goals of the war had long been forgotten, both side now possessing an intense blind hatred for the other. Mishral II had never been healthy, and over the course of his reign he almost never sets foot outside the royal palace in Maradaine. He also proved unable to father a child. When he finally died in 808, his successor had already been chosen. Mishral took part in the choosing, though many lords found fault in it. The new king was Duke Halitar of Delikan, who was eligible due to being Cedidore’s great-great grandson (by Cedidore’s fourth son). When historians point out that there had already been a King Halitar, he takes the throne as King Halitar II (808-815). Both he, and later his son, focus one rebuilding what is left of Druthal as a strong nation. Halitar III (815-831) has Druthal build ships again, contacting those on Corvia. To a limited degree, he re-opens trade routes, as Druthal still controls the best source of wool. Some of those prime wool sheep are raised outside the city of Erien, near the border of Patyma. As it is a valuable commodity, the Patymics send their army in, trying to claim all the wide pastureland that the Druths control north of the Patyma River. Halitar III leads the Druth army against them. Starting in 826, the Druth and Patymics gain and lose control over Erien, the city crumbling around them, for several years. Then in 831 the king is killed defending the city. Halitar III had no sons, and the various lords were primed to pick a new king, and several candidates began politicking and backstabbing to gain the throne. Some thought they could increase the legitimacy of their claim by marrying Halitar’s daughter, Mara. Mara was not interested in any suitors, and announced that she would claim the throne for herself. Some lords considered this a joke, but Mara, who had learned the art of swordplay from her father, showed the lords that she was not to be laughed at by disemboweling several of them in the Council chambers. The rest quickly crowned her Queen Mara (831-838). Mara pushed the authority of the crown to its limits, as she herself took charge of the Druth army at Erien. The soldiers were at first reluctant to follow her, but she showed that she also had a keen tactical mind, and under her command, they routed the Patymics. Her rule did get her many enemies though, most notably Lord Ferrick of Abernar. Lord Ferrick, at first covertly and then openly, attacked the legitimacy of her rule. He did this, though, by challenging the legitimacy of Halitar II’s claim to the throne. Ferrick himself also descended from Cedidore, through the second eldest son (though it was not a straight male line), and therefore by all rights his family should hold the royal position. His supporters grew, and eventually rose up against Queen Mara. Mara refused to give up the throne, fighting to the last. According to legend, she defended the throne room in the Royal Palace, killing twenty knights before she was slain, and she died on the throne still holding her sword. And thus Ferrick (838-861) was made king. Despite the bloody beginnings of it, his rule was quite benign and enlightened. 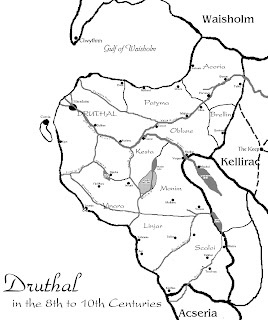 Druthal’s peaceful relations with the power bloc of Kesta, Opiska and Yinara allowed for increased trade. Druthal also negotiated with various Fuergan and Imach traders, creating diplomatic enclaves at the harbors of Kyst and Maradaine, which made those ports more attractive for foreign ships than Lacanja or Yoleanne. The shipyards of Kyst worked to build up a strong Druth Navy. all came together and attacked Acoria. The army of Acoria was in no way prepared for the full might of Waisholm, and the entire country was overrun in 845. Several hundred refugees took to fishing vessels to escape the Waish, traveling along the northern coast and then turning south until they eventually landed on one of the northernmost Napolic islands, where they formed New Acoria. The Kierans then declared war on Waisholm for these actions. They pulled out all of their “peacekeeping” legions from the west and Kellirac to attack the Waish in Acoria. The Waish responded to the Kierans, and soon the two nations were fully at war with each other. Through the 850’s, the Scallics and the Linjari became unable to continue their war, as both sides were so utterly drained of resources and men from the effort. The border between the two was called “The Wall of Bones”, for it was literally a barrier made of eight generations of their dead. Acserians send relief to both nations in exchange for a cessation of hostilities. The two nations agreed, and the Acserians came with relief, food, and the word of God, all of which they spread throughout the two nations. By the reign of Ferrick II (861-883) the Acserian church had taken a strong hold of the Scallic people. It had also spread into southern Monim, as well as into Kesta and Yinara. In Linjar, in didn’t take as strong a hold, as the Linjari loved what the Acserians would call “sin and hedonism”. Eastern trade is disrupted when the Tyzanian Empire falls apart, throwing its entire continent into turmoil. It was during the reign of Ferrick III (883-903) that the institution of slavery (as is allowed by Acserian doctrine) came back into fashion in Scaloi and the southern parts of Monim, usually using Linjari for slaves. The people in northern Monim were appalled by this and in 892 they broke off from the southerners, creating North Monim. Since a majority of the Monic army was northern, they were able to effectively create and guard the border. They declare the practice of Acserianism to be illegal in North Monim. Acserianism has a hold on all of the people of the west, with the exception of Linjar and Opiska, when Ferrick IV (903-915) comes into power. The real test of this comes in 907, when Allynum, an extreme member of the Fundamentalist side of the Church, is elected Rei. He passes a number of anti-magic and anti-tolerance laws in Acseria, and a number of the Druth nations follow suit. Druthal itself does not, as Ferrick IV is not a believer in Acserianism. A large number of the Druth people are amongst the faithful, though, and there is a growing feeling that the king does not speak with the voice of authority since he has no faith in God. The people rally around Kellith, second cousin to Ferrick, and a vocal proponent of the Acserian faith. Faced against this, Ferrick abdicates the throne and exiles himself to Corvia. Kellith takes the throne and the people rejoice, although later most historians would call him Kellith the Cruel (915-934). 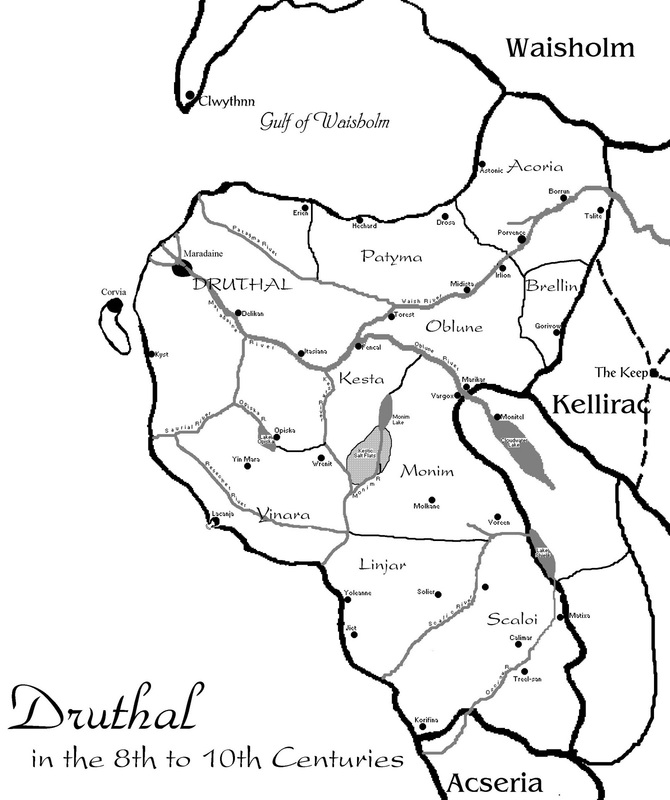 Kellith immediately declared that Druthal would again be a whole nation, starting with the heathens of Opiska. The Druth Army thundered into Opiska. Both Kesta and Yinara then declared war on Druthal, although they did not ally themselves together. Opiska became the burning battleground for their three-way war. Kellith also would take any opposition to his orders, even to the point of slight disagreement, as a challenge to his power, and since he was on the Druth throne by the divine right of God, it was a challenge of God, and therefore heresy. Heretics, by his decree, were to be tortured and crucified. The Druth nobility quickly took up the policy of staying quiet. Since the Druth attention was focused in the south, Erien and the surrounding countryside was left undefended. In 919 the Patymics moved in on this opportunity, capturing the territory with almost no resistance. Patyma, Oblune and North Monim also signed a mutual defense treaty, as the Waish/Kieran war had now spilled over into Brellin and Kellirac. The Kings of these three nations also affirmed that the Rei of Acseria would get no foothold in their countries, and the northwest became the only safe area for free thinkers and practicing mages. In 934 Kellith and several of his close advisors die during dinner, which was obviously poisoned. His son takes the throne as Kellith II (934-938), and various lords persuade him that he is needed on the war front. He goes, giving the group of lords who were plotting against the line of Kellith some latitude. They wished to remove him from the throne, but needed a suitable replacement that the people would accept without hesitation. As they discuss in secret, a breakthrough is reached when Baron Culathain casually mentioned the differences between the Acseram and Kellith would quote and the one he possessed. Some of the other lords examined his copy, mostly out of idle curiosity, and found it to be almost a millennium old. Culathain explained that the book had stayed in his family for all these generations, noting the record of births that had been written in the back of the book for the past centuries. This record revealed (unbeknownst to Culathain) that this Acseram was given to the first King Maradaine by Galena as a gift, and the lineage it marked was Maradaine’s—Culathain was a direct descendant of the first king of Druthal! Knowing they now had the strongest possible claim to make on the throne, this discovery was announced to the populace. It was met with skepticism until Kanna Ishien, the Church’s representative in Maradaine, verified the authenticity of the book. Kellith II got the news and rushed to Maradaine to find himself neatly deposed, and Culathain being coronated Maradaine VII (938-964). Maradaine VII quietly ceded the war in Opiska, pulling Druth troops out. The Kestans quickly moved in and annexed the area. Neither the Kestans nor the Yinarans gave up on fighting Druthal, though, as both armies began to push at the southern border, forcing Maradaine to keep the bulk of his troops there to defend it. By 940 these armies stop trying to invade Druthal, but keep their forces at the border as well. The next few decades are marked with a “quiet, uneasy peace” in which most countries took up an attitude of isolationism, as it seemed the slightest misstep might trigger a new war. The only contact between nations was through the Acserians, who had missionaries and ambassadors throughout the Druth Nations. All nations began to build their armies and hoard as much gold as possible, knowing that some great war was coming. The lowest classes suffered the most from this, as they were heavily taxed. Druth ships started traveling east again during the reign of Maradaine VIII (964-988). In the wake of the fall of the Tyzanian Empire, the territory known as Bürgin had become a major power, showing dominance on the oceans. Another major power in the midst of several petty kingdoms was Lyrana, which seemed to be holding on to several Tyzanian traditions. Neither country seemed to be worth trading with, however. As Maradaine IX (988-1009) came into power the tension between the nations was intense. All borders were closed, except for between Patyma, Oblune and North Monim.